Buchla 208 Music Easel - Slider Cleaning! While vintage synthesizers are amazingly good fun for the sound and historic value, they do require a lot of care. I’ve owned this vintage Buchla system for nearly 25 years, and it was finally time to take on the daunting task of servicing the sliders. The controls were sticking and at certain points and other points would lose contact, so the instrument was “partially” usable. I missed the opportunity to get a set of new sliders from Luther, and I asked around the vintage easel network to see if anyone had spares. Unfortunately, none are available. As a last resort, I decided to take on the task of cleaning each slider individually. It was deeply saddening to hear about the passing of David Wessel. Professor Wessel was one of the important pillars of the academic community for his contributions towards the advancement of computer music technology. During the 1970s and early 80s, he was involved with IRCAM (Institut de Recherche et Coordination Acoustique/Musique), and eventually took a position as Director of the Center for New Music and Audio Technologies and Professor of Music at UC Berkeley. 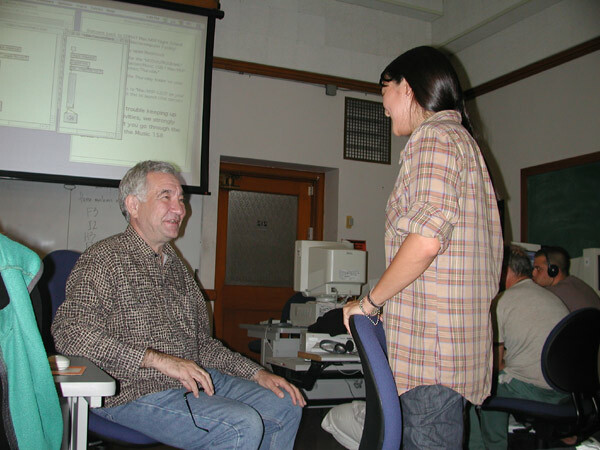 I had the pleasure of taking a summer course at CNMAT where I met Professor Wessel in 2001. This was about the time when Open Sound Control (OSC) was being developed, and I vividly recall his presentation on gestural control systems and the musical application of expressive real-time control of computer generated audio. At a time when most people were still working with traditional systems of sequencing, recording and synthesis in computers, CNMAT, under Wessel’s direction, was pioneering the future of electronic music technology. Professor Wessel had a natural gift of explaining rather complex concepts of max/msp and his pedagogical technique inspired the methodology behind the many bits of content I’ve developed over the years. For this, I will be forever grateful. Thank you Professor Wessel for pushing the weirdness envelope, and showing us the way. The Werkstatt-Ø1 is a monophonic analog synthesizer with with a single VCO, resonant low pass ladder filter, LFO, envelope generator, one octave keyboard, and mini patch bay. 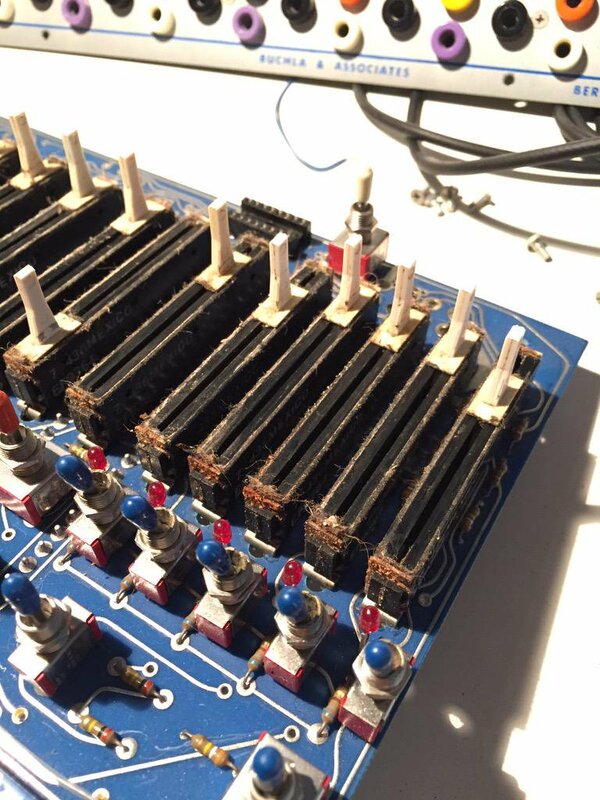 Using jumper wires, you can experiment with different patch routings. While it’s a fun unit on it’s own, the circuit board has a section designed specifically for experimenting, and clear points that allow you to make modifications. I borrowed this TT-303 Bass Bot (TB-303 Clone) to take to Asheville. Like the TB-303, the TT has CV/Gate outputs. I was hoping to punch some holes and add 3.5mm jacks during the workshop, but had to settle on making a couple patch cords. 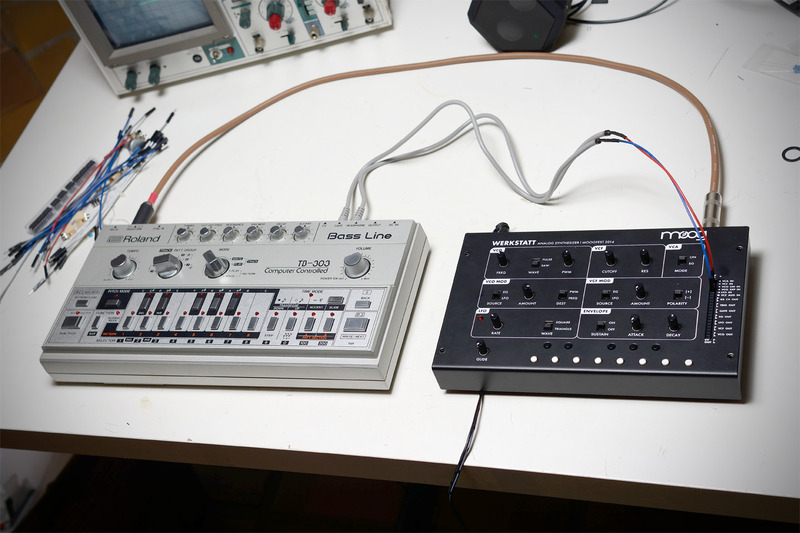 The TT-303 CV out is connected to the Werkstatt VCO, and the 303 Gate out is connected to the Werkstatt VCA. 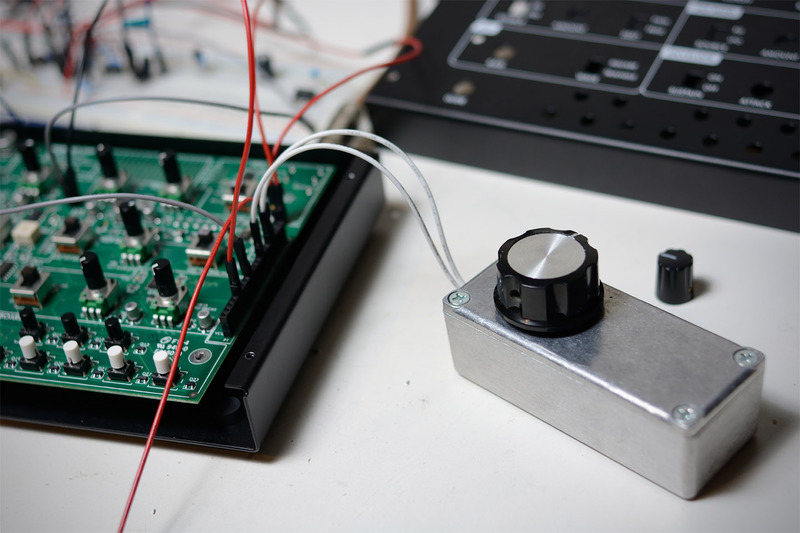 The Werkstatt design is ‘somewhat’ influenced by the Eurorack modular format. It has a height of 3U, so it has the same vertical dimension of a Eurorack module. It runs off a 12V DC supply voltage, and so it can be powered from a Eurorack supply. 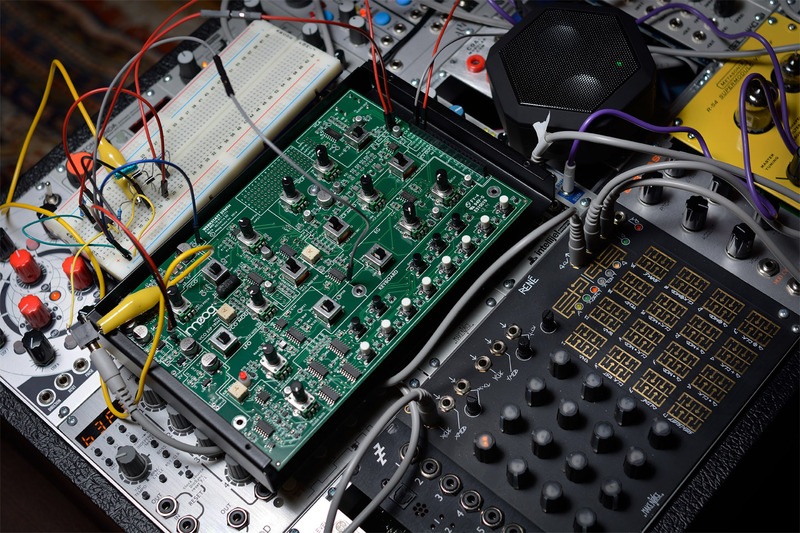 Despite these commonalities, it would be difficult to convert the Werkstatt to a Eurorack module without considerable hacking. The 1/4” audio output jack and the power connector jack are situated right on the edge of the PCB, which is already too large to fit between Euro mounting rails. If someone were to fit this in modular case, they would have to customize the space to accommodate the entire box. The Werkstatt has the potential to complement a modular rig, but the header patch bay lacks a common grounding point, making direct connections with outside gear a little more difficult. For basic routing, I’ve made jumper cables that have a 3.5mm plug and terminate with a patch pin. Grounding is achieved by routing the Werkstatt audio output to a mixer/vca module in Eurorack system (1/4” to 3.5mm mono patch cord). This is probably the easiest (and least destructive) way to interface the Werkstatt with modular gear. In this photo, the TB-303 CV/Gate outputs are patched to the Werkstatt VCO EXT In and VCA In using the 3.5mm to single pin patch cables. Common ground between the 303 and the Werkstatt is established by connecting the audio to the 303 Mix input. This is important because if there’s no ground reference, the CV/Gate signals will not control the Werkstatt. The kit includes a few patch jumpers (3M - part number 924962). You can find other brands of leads designed for arduino experimenter kits that connect into 0.025” headers. 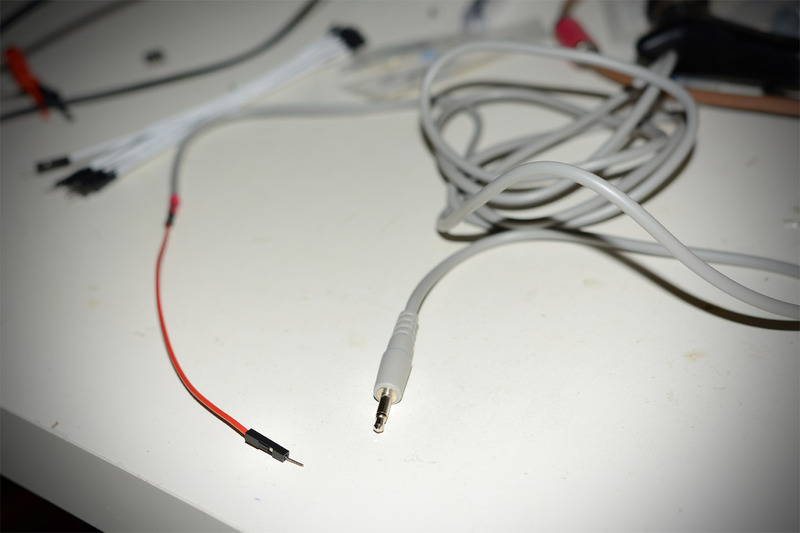 I found these jumpers by Osepp, (part number LS-MMPJ-6) and soldered the ends to a mono patch cord. The joint is a little delicate, so it’s important to use some shrink tubing to insulate and reinforce the connection. On the patching header, there is an input called “VCO EXP In” which is the oscillator pitch control that can be modulated from a step sequencer. The Werkstatt follows the tuning convention of 1 volt per octave, and will interface with Eurorack sequencers. If you are using a module that outputs quantized voltage values like the Make Noise Rene, this input may require calibration. 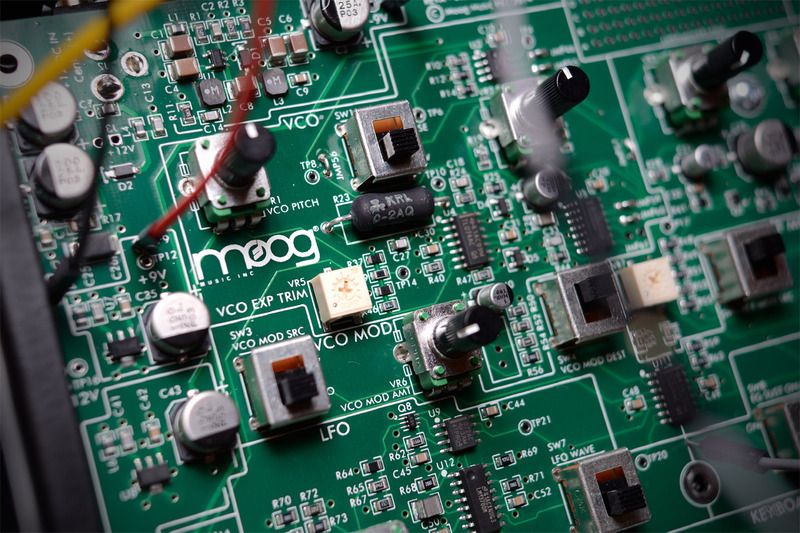 The VCO EXP TRIM knob is VR5, located right below the “moog” logo on the circuit board. Basically you send 1 Volt DC values into the VCO EXP In pin, and adjust the VR5 using a small screwdriver until you hear octave divisions playing from the Werkstatt. 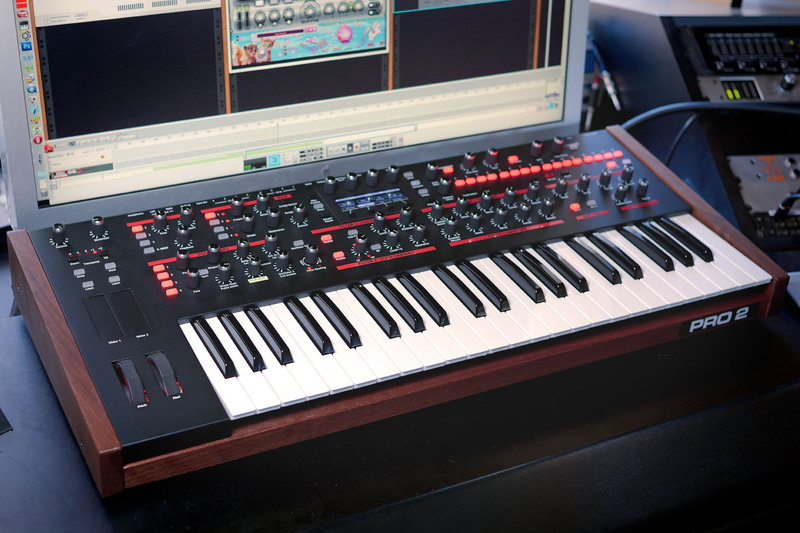 Adjusting this control will not affect the keyboard tuning, only incoming pitch cv scaling. We were told that Bob Moog always used a frequency counter to calibrate synths, but you can adjust it manually by using another oscillator as a reference. Once the VCO EXP TRIM adjustment is accurately calibrated, the Werkstatt should track perfectly with a CV keyboard or sequencer. Using a 500k potentiometer and a couple of jumper leads, a simple attenuator can be incorporated between routings. 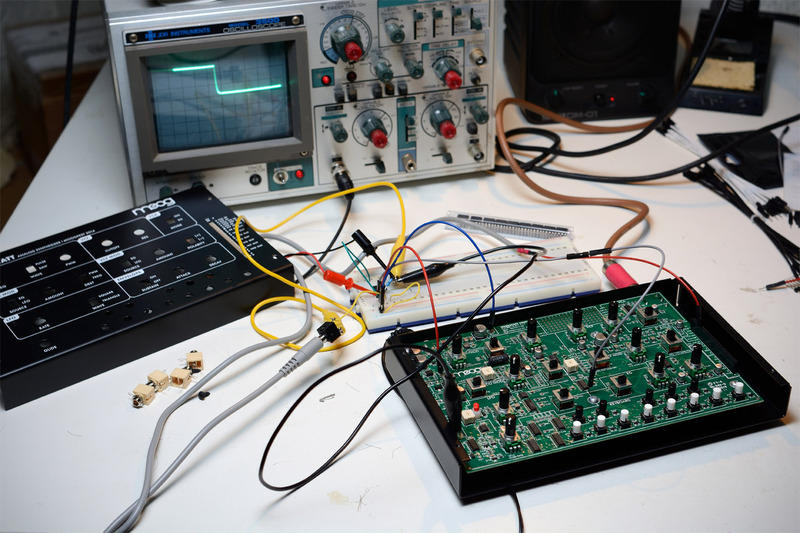 You can patch the VCO into the VCF and control the intensity of the cutoff frequency modulation. 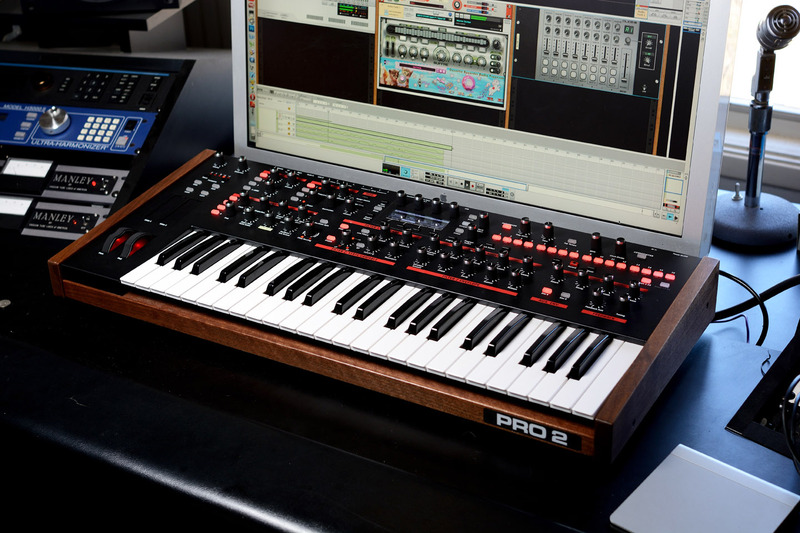 500k is just enough resistance to scale the keyboard control voltage to the LFO, and this allows you to have two tuned oscillators by patching the LFO out to the Audio input. With a little extra work, you can mount the potentiometer in an enclosure, and then add your favorite style of knob! In the photo below, i’ve mounted the potentiometer (alpha part RV16AF-10-15R1-B500K) in a Bud Industries, die cast enclosure (part CU-123) with a Davies knob. Most of us who built the Moogfest Werkstatts have contemplated whether or not to apply drastic modifications to these units. They are are the first batch to come out of the factory which already has a special significance, and it would be a shame to butcher the unit. Lately I’ve been tossing around the thought “What would Bob Moog do?” And the answer i keep coming up with is that Bob would probably mod it Below are a few modification ideas. Some are original and others are ideas passed on from Steve Dunnington during the Moogfest workshop. The easiest mod is changing out the keyboard buttons and replacing the whole note keys with white button caps. The added contrast makes it easier to find your position along the scale and gives it an overall cooler look. The tact switch key caps come in a range of colors and are available from the major online electronic component suppliers. I’m using the Mountain Switch 101-0209-EV. Be careful when removing the old key caps so that you don’t break a solder joint. They should pop off by hand without too much effort. One mod that I’ve been obsessing over is an Envelope Trigger input. While you can apply an external envelope signal to the VCA or VCF input patch points, there is no way to actually trigger the envelope except through the note buttons. I’ve been experimenting with various ways of tapping into the circuit. The envelope generator has two modes: Pulsed and Sustained. When a key is pressed, both a sustained gate and 5ms trigger are generated and sent to a selector switch (SW8). From the switch either the pulse or sustained gate signal passes to the slew circuit. 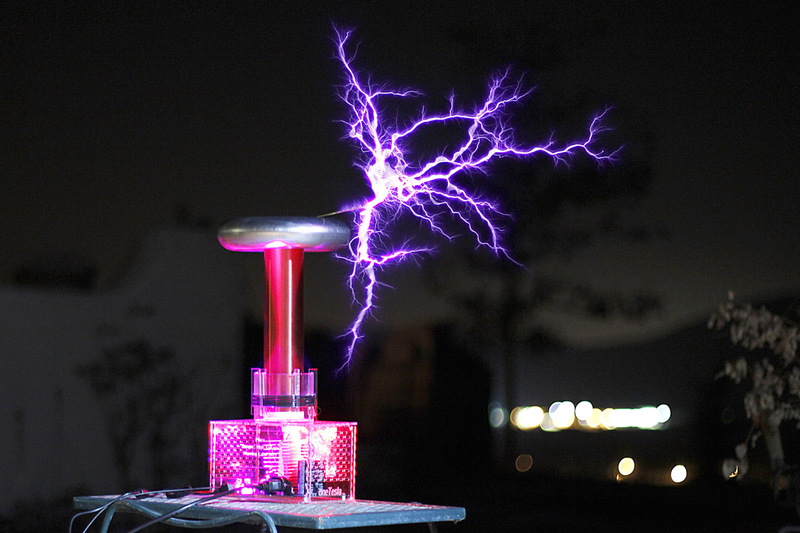 So far using a voltage follower has been the most reliable and way of applying external gates into the envelope. This will ultimately be added to the experimenter section of the circuit board, and it will be necessary to cut a trace to insert this connection. I’ve breadboarded a voltage follower and patched it into a solder trace on the Werkstatt. An external gate from an XAOC Moskwa sequencer (which can be finicky) runs through the voltage follower and into the envelope generator. 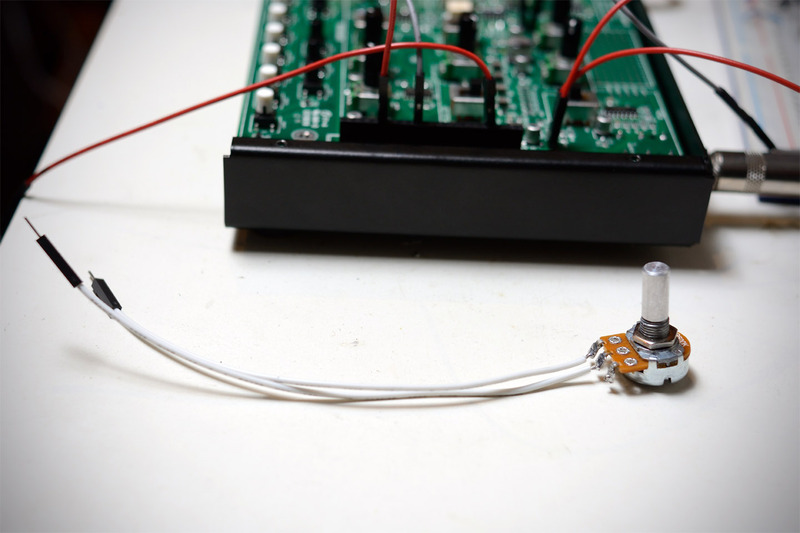 One of the mods suggested in the workshop was adding a diode clipping circuit between the filter and VCA. There’s a jumper on the board where you can insert a passive (or active) distortion circuit for a little extra character. Using a few spare parts I managed to get a nice diode clipping circuit going. It’s a nice mod, but i’m not sure i would always want it active, so part of this plan is to add a switch that will bypass the distortion. In this photo, the Make Noise Rene is sequencing the Werkstatt. 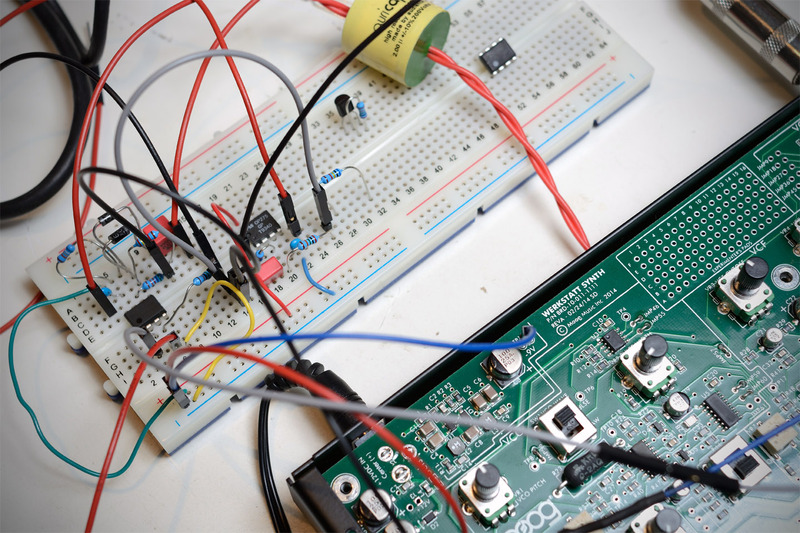 The gate from Rene goes through the voltage follower circuit (on the breadboard) and triggers the envelope generator. The distortion effect is also wired in on the jumper between the VCF and VCA. The Werkstatt PC Board has a jumper connection that links the output of the oscillator to the filter section, providing an access point to run a signal though the filter alone. 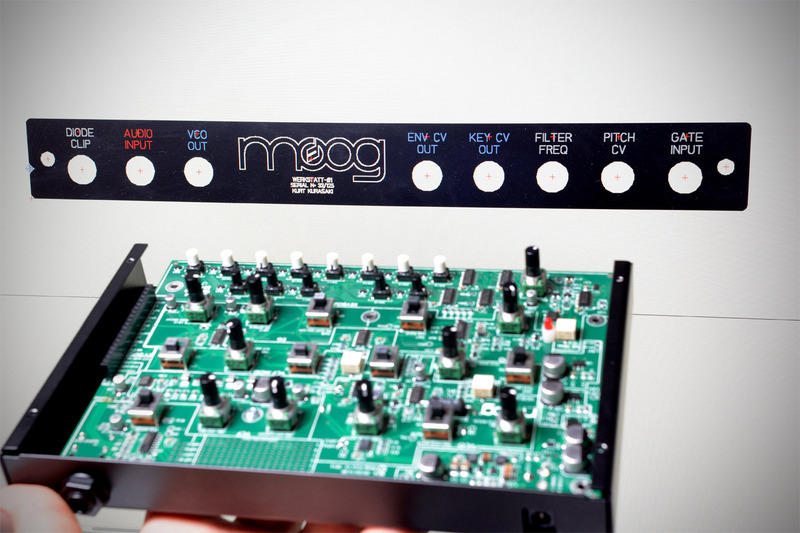 You can still modulate the cutoff frequency with the LFO or apply some FM modulation by patching the oscillator to the filter cutoff, and run another audio source like a drum machine or external module though the moog filter. During the Moogfest workshop, Steve Dunnington showed us a prototype mod he applied with an audio input buffer that taps into this point. This mod, however, is destructive and requires the addition of some circuitry and a switching input jack, or a separate switch that disables the oscillator. Drilling holes into the Werkstatt is ultimately going to be the most daunting task. Having little skill as a machinist, there’s the distinct possibility of messing this up. As a measure of precaution, I’ve decided to have an aluminum panel made by Front Panel Express with the holes precut. Not only will this look neat with clearly engraved labels, it leaves a little room for drilling errors into the Werkstatt itself. There isn’t a lot of vertical clearance between the PCB and the bottom of the case, but as long as the holes are centered along the axis of the existing power and audio jacks (approximately 9.1mm from the bottom of the case), a typical Kobiconn 3.5mm jack will fit (sideways) with a just enough of the bushing to fasten it down. Since the experimenters pads will be used for the gate buffer and distortion circuits, so I’ve avoided populating that section with jacks. Some of the components may have to be mounted under the PC board, and so the extra clearance is required. The mechanical engineering is something that takes me a little extra time, primarily because I’ve been prone to really dumb mistakes. When completed, I will be able to patch the to and from a modular rig with ease; essentially making the Werkstatt a stand alone module. Hopefully, this will all work out. 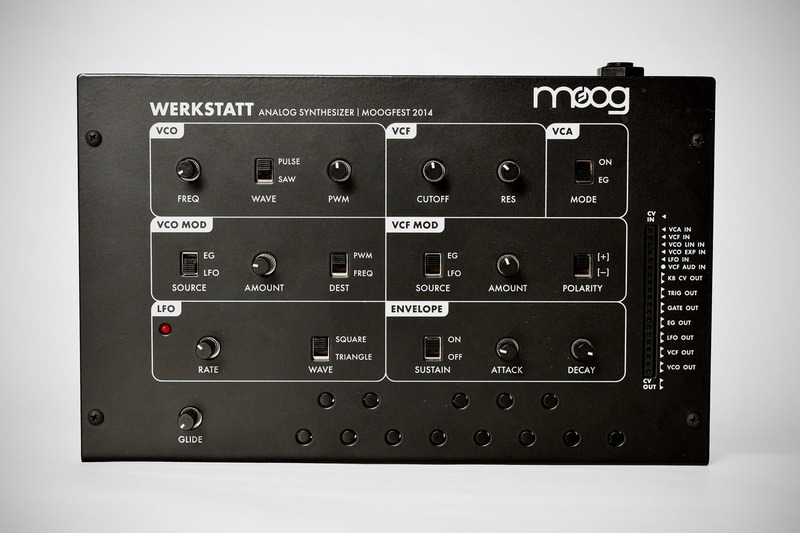 Robotspeak in San Francisco is a dealer for the new batch of Moog Werkstatt Kits, and I’m going to organize a day or two to talk about using it with other analog gear, build patch jumpers, and work on some of the mods described above. Yes, including the custom patch panel. 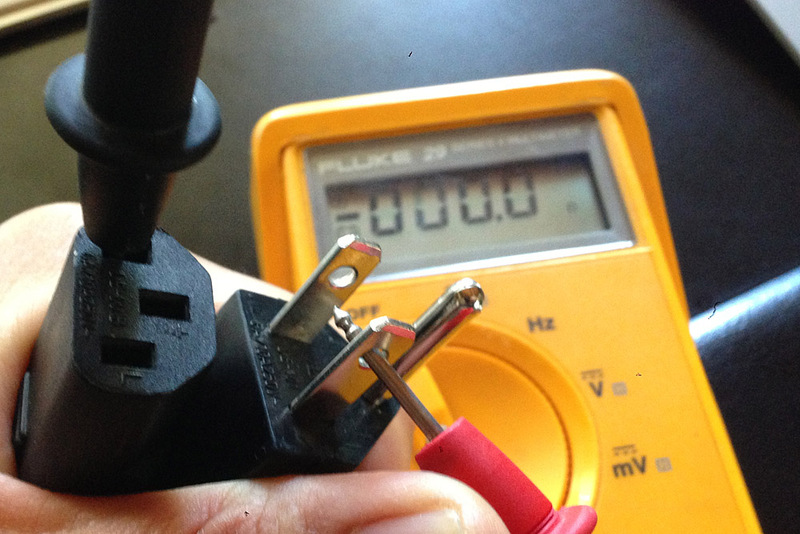 A continuity test revealed that this cord is essentially cross wired. This means the Neutral from the mains is connected to the Load of the IEC connector and the Load (Live wire) from the mains is connected to the Neutral. In the photo above, you can see continuity between the Load contact and the Neutral on the IEC connector. Even with the synth switched off, power was running into the system, and a bit of current was finding it’s way to the panels and case. Unfortunately, I have no idea how this cable was acquired. It was just in the box of power cords, and presumably correctly assembled (how the heck can you mess up 3 connections?) 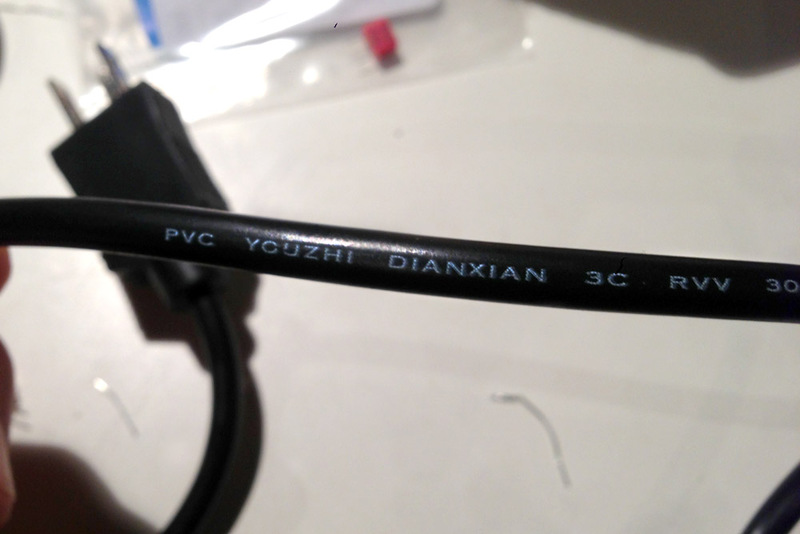 The cord is labeled, “PVC YOUZHI DIANXIAN 3C RVV 300/300V,” and it’s missing the country of origin. A quick websearch reveals that it was manufactured in China, and YOUZHI DIANXIAN is known for other substandard cable products. Cable has been properly destroyed, and is ready for recycling! Moral of the story: always use the IEC cable supplied with the gear or test the contacts to make sure they are not crossed before you connect to the mains. The Cassette Recorder Audio Processor Rack Extension is an analog emulation effect for the Reason Rack that will enhance your audio with the smoothness and colour unique to analog recording. Yes, CRAPRE adds the warming sound of ground loops and tape hiss while enhancing incoming signals with harmonic destroytion! Our crap staff of mad nerdbags has discovered a special undocumented feature of the Rack Extension SDK: a colorful user interface with pink knobs, kittens, rainbows, and unicorns optimizes CPU usage while psychedelically extending the digital music stuff from 32 bit to a whopping 41 bit super-endian-rainbow-floatiger maths! In laymen’s terms, this means Crapre sounds terribly good! The wow and flutter algaerytm adds a deluxe warmingness, and it even simulates “tape eating” for hi definition low fidelity realistic results! 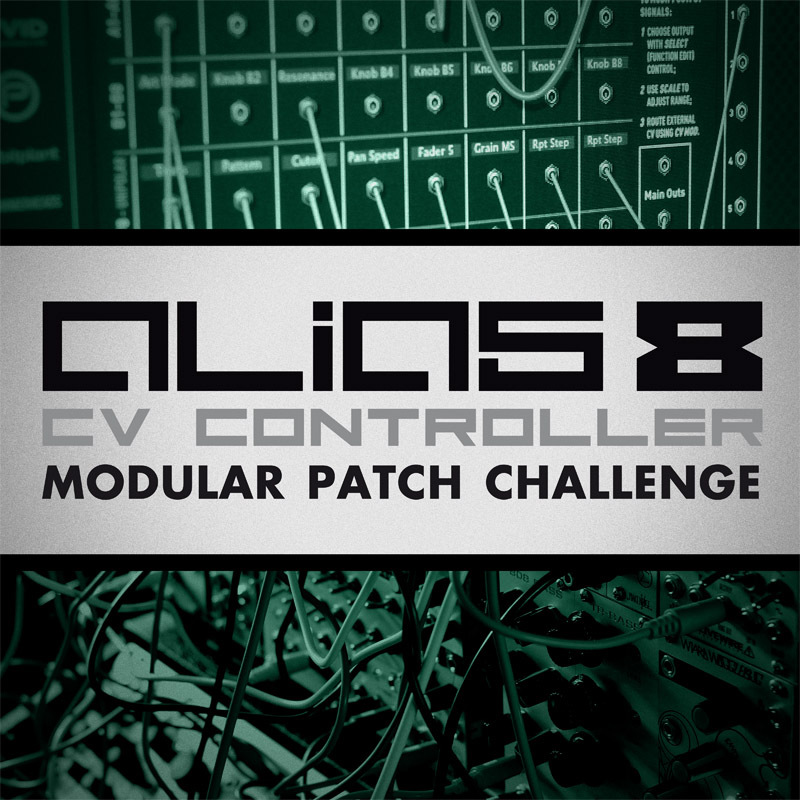 Alias8 CV Modular Patch Challenge! Thanks to all those who participated. We now have a winner!